Robyn Williams: Now I wasn’t in the room at the time, but it is claimed that George W Bush once complained about the Arabs: “Why is our oil under their sand?” Well, whether he said it or not, the question has become even more stark as the Middle East gets even more fractious. Would you really want to depend much longer on secure oil supplies from the region? As for coal: As more and more coal mines close in Australia and disasters recur from China to Turkey, you’d have to ask whether that technology is also about to hit the ashcan of history. Perhaps, but not yet, says Graham Palmer in Melbourne. He’s an engineer and has done research in the field of energy futures. And by the way, bear in mind that PV stands for photovoltaic. You can download the audio and read the transcript (with supporting references) here. Between 2007 and 2013, the global motor car fleet grew by 3.6% annually, reaching 1.1 billion , but during the same period, the annual growth of crude oil including total liquids averaged only 0.9% . Driven by demand in China, but also Russia, India, and Brazil, the growth is projected to continue indefinitely , but given a crude oil price of around USD$100 bbl, we have already entered a prolonged period of inelastic supply, and regardless, capital investment in the oil supply industry has tripled in the past 10 years . It is obvious that there simply isn’t the ready supply of conventional liquids to accommodate the growth of motorcars. Further, any discussion of the sustainability of motorcars should encompass a broader discussion of urban planning , public transport, and a re-examination of the travel task . Comprehensive assessments of the life-cycle analysis of EVs shows that they can be better than internal combustion engine (ICE) vehicles, but still a long way from “sustainable” [7,8]. But whether we like it or not, the egg has been scrambled, and motorcars will continue to be the primary mode of transport in Australia for the foreseeable future. Assuming ongoing demand for motorcars, there would seem to be limited options to square the circle – improve the efficiency of the motor car fleet, reduce the distance travelled per vehicle, or shift to alternative energy sources and fuel carriers, hydrogen fuel-cells, Olah’s methanol economy, coal-to-liquids, etc. All of these broad options have been widely canvassed, but this discussion will focus on electric vehicles (EVs) and plug-in hybrid vehicles (PHEVs). The battery remains the weakest link to electrifying the car fleet, but the widespread tendency to couple EVs to a renewable energy framework is a curious trend that I will argue is a bad idea at several levels. An alternative synergistic low-emission model will be proposed. The theory of Peak Oil emerged from the general Limits-to-Growth concerns in the 1970s. 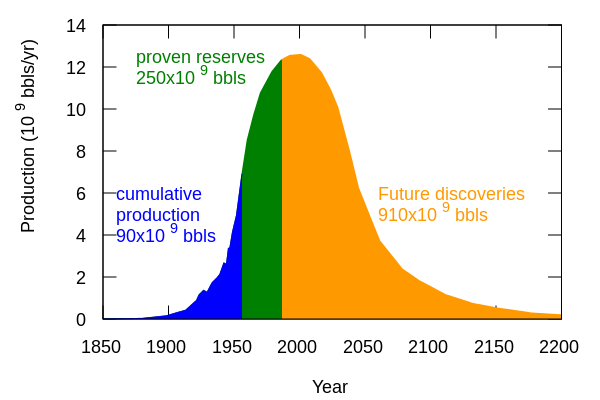 The conventional view of peak oil was that demand would eventually outstrip supply and drive a rapid and severe increase in the traded price of oil. The CSIRO Future Fuels Forum from 2008, postulated Australian petrol prices peaking at between $2.60 and $8.20 per litre by 2020 , and typifies the notion of dramatic oil price shocks and limited supply. In contrast, energy theorists such as Charles Hall and Carey King [10,11] prefer to describe peak oil as a macroeconomic phenomenon, which applies a brake to national economies. Taking a macroeconomic perspective, it becomes obvious that prices of $8 are implausible because national economies simply couldn’t sustain them. For net-importers of liquid fuels, including Australia, a ballooning trade deficit will be another concern. Hall and King place net-energy (EROI) at the centre of our understanding of resource depletion and the decline in resource grades. At face value in isolated communities, for example, the idea of using PV to charge EV batteries can seem like a good idea, although such a system is possible only because of a massive embodied energy subsidy in the form of fossil fuels. But when a comprehensive approach is taken in the context of modern grids, it is not at all obvious that EV charging and PV are particularly well suited. The problem is that available solar supply will be inversely related to the preferred charging regime – i.e., there will be no PV power available for night time charging when the grid has spare capacity, but during the three or four hours centred on solar noon, few motorists will want to “fill their tank” at the peak daytime tariff, only to re-plug their vehicle in at night to sell back into the grid at off-peak tariffs. Further, the batteries will be the main limiting factor of EVs for the foreseeable future and are cycle limited – car manufacturers are concerned with optimising the battery for range, cost and longevity [13,14,15]. The resulting degradation from additional daily cycling to support PV will reduce the longevity of the batteries and prove uneconomic for motorists. Turning to wind power, wind has two benefits over PV; the wind blows at night, and doesn’t suffer a dramatic seasonal drop off in power. But we need to be careful in the way we think about the purchase of Green Energy. The concept of reaching “net zero emissions” is really just a convenient elision – Green Energy is based on the measured annual energy balance and bears no relationship to the correlation between the real-time demand profile and actual supply. The notion that purchasers of wind power “own” the power makes absolutely no sense in a complex systems sense. The “net zero emissions” hypothesis only works in the world of statistics when system energy is allowed to be averaged over a year. But if power flows are analysed at sub-hourly time scales, the relationship completely breaks down. A thought experiment which illustrates the “net zero emission” dilemma is to imagine that everybody purchased 100% Green Power. In theory, this would require a massive over-build of wind and solar power across the continent. But how would the residual system emissions be allocated? How would the costs associated with networks be allocated? How would the costs of intermittency and balancing/storage/energy spillage be allocated? Clearly, the remaining coal/gas and other emissions would need to be allocated somewhere; therefore it is clear that a comprehensive assessment would essentially invalidate the net-zero concept. In the real world, Green Energy is a marketing tool, and it is more valid to say that Green Power is essentially a donation to reduce the system emissions below what they would otherwise be, but that the reduction is shared across all consumers rather than being “owned” by the Green Power purchasers. So what is the alternative model for EVs? It is difficult to imagine a more obvious synergy than that which exists between EVs, baseload power, and network businesses. To begin with, the overwhelmingly most popular and convenient method of charging is overnight at home . This aligns with an affordable off peak baseload model where spare capacity is available year-round, whilst underpinning the business model for baseload generation. The improved utilisation of the distribution network would drive the per-unit network tariff downwards and provide a tariff reduction for all consumers whether they owned EVs or not. This is in sharp contrast to the regressive solar PV feed-in tariff model – our socialised energy-based tariffs lead to an under-charging of the fixed network costs for PV consumers, thereby leading to a wealth transfer from non-PV households including renters, pensioners and others. If the owners of the EV batteries (whether they be the vehicle owner, lease company or other third party) were able to capture the avoided network investment costs of providing critical peak demand support through advanced vehicle-to-grid (V2G), once again, all consumers would benefit. Such a strategy would require regulatory reform since the current arrangements do not allow for such incentives. The year-round, predictable, and controllable load of EVs will present a “gold plated” demand profile for baseload generation, and afford certainty of demand for investors. In contrast, the current market distortions induced by the RET and other climate policies reduce certainty for all investors, and undermine the business case for conventional generators. Hence the notional linkage between EVs and wind/solar is undermining the very synergy between baseload and EVs that will accelerate their deployment. If we divide the annual electricity consumption by 365 days and average the daily load over 6 night-time hours, the averaged demand equates to 3.6 GW. This is less than the headroom between the typical overnight baseload demand and annual peak demand, suggesting that the Victorian system already possesses sufficient capacity to accommodate a significant shift to electric with no additional generation or network capacity. Hence the marginal cost of energising the entire motorcar fleet is extremely low. This example highlights the enormous benefits of improving the load factor and maximising the system efficiency. The load factor of the Victorian network in 2010, as a ratio of average demand to peak demand, was 59%. Shifting EV charging would raise the load factor to above 70%. This can be contrasted, for example, with the Budischak et al. renewables simulation in the US, which resulted in an adjusted load factor of 9%  due to the requirement for a massive overbuild and redundancy. Turning to the emission intensity of motorcars, we use the Nissan Leaf EV and Nissan Pulsar 1.6 litre petrol for comparison, and assume the electricity is derived from baseload in Victoria as a worst-case emissions scenario. It is interesting that, even assuming lignite baseload, the much better drivetrain efficiency of the EV gives the Leaf a comparable emission intensity to the 1.6 litre petrol Pulsar. If the comparison were done for the other states, the EV would rate better, or in the case of Tasmania, much better. In practice, the primary driver of the mass uptake of EVs and PHEVs will be fuel-efficiency economics. The average fuel economy of the Australian motorcar fleet is 11.1 l/100km, which is around 50% higher than the EU and Japan. On top of this, the IEA  notes that a 25% improvement in efficiency could be achieved if technologies already commercially available were more widely applied. In a meta-review of technological improvements, the IEA  concludes that there is scope for a 28% improvement in efficiency in diesel vehicle by 2020, rising to 50% by 2035 due to vehicle, engine and transmission improvements. Features such as the widespread use of dual-clutch transmissions, improvements in auxiliaries (air conditioning, power steering etc), thermodynamic cycle improvements, and weight reduction provide scope for the largest gains. Hybridisation and downsizing offers further significant gains in efficiency. Hence EVs will be chasing a moving target, while batteries still have some way to go to meet “specific energy density” and cost targets. My personal view is that the mass take up of EVs is still some way off, possibly by the mid-2020s. In 2013, global sales of EVs and PHEV totalled 0.26 million, or around 0.3% of car sales . The average age of the Australian fleet is 10 years, so there is already significant inertia in the fleet, even with a shift in new car sales. Nonetheless, the application of a synergistic model, possibly one in which generators and network business take a stake in leasing EV batteries to motorists, will optimise their potential, and provide broader economic benefits to Australians. As the baseload fleet retires over the next 10 to 30 years, there will be the opportunity to build a new fleet of pollution-free, near-zero generation that will power an increasingly electrified society, and be supplying baseload power into the twenty-second century. Newman, Peter WG. “Sustainability and cities: extending the metabolism model.” Landscape and urban planning 44.4 (1999): 219-226. Moriarty, Patrick, and Damon Honnery. “Low-mobility: The future of transport.”Futures 40.10 (2008): 865-872. Crist P. Electric vehicles revisited: costs, subsidies and prospects. Discussion paper No. 2012-03; 2012. PE International. Life cycle CO2e assessment of low carbon cars 2020–2030. Low Carbon Vehicle Partnership: 2012. Graham, Paul, Luke Reedman, and Franzi Poldy. Modelling of the future of transport fuels in Australia: a report to the Future Fuels Forum. No. IR 1046. 2008. King, Carey W., and Charles AS Hall. “Relating financial and energy return on investment.” Sustainability 3.10 (2011): 1810-1832. Trainer, T. (2013) 100% Renewable supply? Comments on the reply by Jacobson and Delucchi to the critique. Energy Policy 2013. Trainer, T. (2012) A critique of Jacobson and Delucci’s proposals for a world renewable energy supply. Energy Policy 2012, 44, 476-481. Budischak, C., Sewell, D., Thomson, H., Mach, L., Veron, D. E., & Kempton, W. (2012). Cost-minimized combinations of wind power, solar power and electrochemical storage, powering the grid up to 99.9% of the time. Journal of Power Sources. ACIL Tasman. (2009). Fuel resource, new entry and generation costs in the NEM, 0419-0035. Warner, Ethan S., and Garvin A. Heath. (2012) ”Life cycle greenhouse gas emissions of nuclear electricity generation.” Journal of Industrial Ecology 16.s1 : S73-S92. I look forward to moving from a diesel Hilux to an EV, hopefully not too far down the track. In my case, range is important because trips of 400km/day or more are common. Quite a sentence. Fortunes can be made from that statement, the lives of billions of people improved, and the prospects for the Earth greatly brightened. EV is a good idea as there is no restriction on the sources of power. All the arguments applicable to power in general are applicable to EV. In addition, the benefits of battery storage are available. The best use of PV in case of a vehicle will be its own roof as PV panel providing a reserve charging system when really stuck for power. “Quite a sentence” — yes, and I think it’s missing a “which”. Or it has an extra “exists”. Any thoughts about the substance? Electric vehicles may be practical for urban use provided they use electricity generated from non-fossil fuel sources. When is that going happen at the necessary scale? For rural areas EVs are not practical now and are unlikely to ever be due to battery constraints. In the longer term (hopefully not too long) the use of nuclear power to produce synthetic liquid fuel would be the cleanest and most economical way to go. Graham,how about doing an article on synthetic fuels? “Sustainable” – The main obstacle to sustainability is where you get the electricity. Not an inherent problem for EV’s, so this is not a negative mark against them. “reduce the distance travelled” – Okay… why, exactly? What’s the problem with driving your EV long distances? “alternate fuel carriers: hydrogen, methanol, coal-to-liquid” – Methanol is an amazing liquid fuel. And coal-to-liquid means manufacturing methanol. So those two are the same thing. Methanol is safer, easier to handle, liquid at room temperature, and importantly, conventional gas engines can be easily converted to use it– methanol is KEY. And so we can discard hydrogen fuel cells for automobiles, and see that liquid fuels are still important for the time being. “not at all obvious that EV charging and PV are particularly well suited” – The paragraph or two leading up to this statement contains some sloppy analysis. It’s already been demonstrated that a fleet of EV’s is an excellent & efficient way to store electricity. The more vehicles, the greater the synergy. The rest: TL;DR – Nothing wrong with it, but it seems to be here just to support the ridiculous claim that renewables, solar and wind, are somehow bad. With EV’s, the source of electricity doesn’t really matter. Sustainability. There’s little point discussing what this word means. To some, it ignores the unsustainable depletion of resources that are critical to the manufacture, inversion and transformation of PV, for example, or of elements needed for magnets in wind generators. “Unreliable” or “Intermittent are far more appropriate descriptors. On to the next topic. What’s the problem with driving an EV for long distances? The answer is obvious and can be found in the current performance of EV’s. Anything above 500km on a charge is not possible and recharge stations are few and far between, or nonexistent. Of course, technology might improve someday, but tin the interim, what real use is an EV? “Alternate fuel carriers”. Unfortunately, not a single one of the suggested options, including the preferred methanol, is economic anywhere in the world. If disagreeing, please cite a reference, because this is a potential game-changer. Who says that renewables are bad? Certainly not this site. Read Barry’s statements on this subject. However, there are limits to the practical application of the intermittent unreliables. Variously, these include cost, speed of construction, land availability, planning and cultural issues, environmental impact, resource limitation, safety, reliability and political will. The same limitations apply to, for example, fossil and nuclear fuels. What I understand BNC to argue for is consideration of all energy options, starting with electrical energy, to be assessed on the basis of an all-factors analysis and not on the irrational assumption that “renewables are always not only good, but they are always the best option”. As for the synergy between EV’s and intermittents, using EV’s as storage devices has been demonstrated to be far from economic and imposes penalties such as weight on the EV, whose primary purposes are to provide reliable, safe transport. Sure, it may be theoretically possible. If it was practical, would not the EV manufacturers be recommending this as a major sales point? They are not, primarily because this would cut deeply into the practical life of their precious and very expensive batteries. This notion simply does not fly yet and is far into the future. My return question to you is to ask what you recommend for this year? This decade? For underdeveloped countries with little capital? For regions with poor security? What do these markets choose in order to reduce their greenhouse gas emissions by 50%? 75%? 100%? Remember, this question is focused on that which is practical and possible, right now – not on technologies that are not yet possible and thus might never be possible. Or even by 120%, in order to remove some of the CO2 from our air and oceans? Germany used coal-to-liquids to produce diesel to sustain WWII, Sasol still does. A fleet of EV’s is an excellent & efficient way to store electricity. The more vehicles, the greater the synergy. Excellent for who? PV owners, EV owners, networks, what is the business case? how many years life of EV batteries are worth forgoing in return for grid revenue? how would network charges of facilitating energy transfer be covered? The whole point of the post is to argue in favour of a synergistic model that benefits all parties that participate in EV charging, including non-participants, and the broader community. The model could just as easily be applied to CCGT, lower emission coal or nuclear. The pack finished the testing with 13% more capacity than at the start. 13% more capacity is an economic benefit. would not the EV manufacturers be recommending this as a major sales point? There is currently no way to get this value stream back to EV owners, so there’s nothing to sell. That can be changed. Even if the pack is never discharged for V2G functions, the use of chargers as a dispatchable load can manage other variability on the grid. If you’ve got 8 hours before the car is needed and it can be fully charged in 3, you can run the charger up and down. So long as the charger averages 40%, you’ll have the battery full at the end. My return question to you is to ask what you recommend for this year? This decade? For underdeveloped countries with little capital? For this year? Cut the nuclear planning and permitting process back to no more than 18 months (it was as little as 10 months under the AEC). This decade? Try to get SMRs into full-scale production, and have at least 2 LMFBRs and multiple pilot-scale instances of MSRs operational. Trial operations of PBRs (e.g. LEADIR) for industrial process heat. Underdeveloped countries can’t afford much fossil fuel either. Cut them off from loans, grants and exports if they start digging coal. Lease SMRs to them at attractive rates. From what i understand, one of the problems with intermittent renewables is what to do with excess power. It needs to be dumped somewhere. So whenever and wherever your electric car is parked, it’s plugged in and either charging up or feeding back into the grid. Google “vehicle to grid”, that should turn up some stuff. I don’t really buy the limited resources argument. There’s recycling, and the solar system is full of rock and metal. We should use it. Peak oil stories persuade the motorist that he has to pay more for his fuel because its raw material is running out. The truth is otherwise. The CSIRO studyquoted was doing economic modelling rather than estimating resources. The peak of eight dollars per litre for transport fuel referred to a sudden restriction of supply of crude oil, with the price partially recovering as consumers chose to buy less fuel. The study went on to say that the long-term price would again be decided by demand when alternate raw materials came onstream to relieve supply. Running out of drillable crude oil might well be a disaster for the oil drilling industry, but it would not be a disaster for the motorist. Oil shales are plentiful around the world (link: Oz), and can be dug up with bulldozers, but need extra processing on site and at the fuel refinery. Coal is also a proven feedstock. Whereas conventional processing fuel from crude oil converts about 20% of the feedstock to process heat and power – and CO2, fuel sourced from coal will have emitted much more. More carbon-efficient is direct injection of coal slurry into stationary engines that would otherwise run on diesel. So supply is not constrained. However demand can be regulated. Carbon pricing is currently the most obvious pressure on the consumer, however public horror as climatic disasters increase may allow the introduction of other measures, such as higher licensing costs for urban internal combustion vehicles relative to the electric vehicles. Even if the pack is never discharged for V2G functions, the use of chargers as a dispatchable load can manage other variability on the grid. I think the issue around V2G is that a whole bunch of possibilities exist once you have a large take-up of EVs/PHEVs, and they are plugged in. The key is trying to work out how this would actually work and make practical/financial sense for all participants. Many ideas that may be technically feasible are simply not going to be practical. The discussion of V2G reminds me of Peter Lang’s brilliant pumped hydro post. Some argued that pumped hydro was ideal for supporting the intermittency of wind and solar without regard to knowing how the arbitrage was going to work, the impact on hydro load factor, or limitations of how pumped hydro works. The real value of pumped hydro is maximised by arbitraging between base load during off-peak periods and peak tariffs – this transaction can occur daily and maximises the utilization of both the pumped hydro and base load – there is a natural synergy. We see the same synergy with EV/PHEV’s and baseload because this is the way motorists will want to charge their vehicles – motorists are going to want to plug in at night to charge, pay the lowest tariff, preserve battery life by minimising cycling, and be confident that their car will have a full charge in the morning. The progression down the shales and coal-to-liquids is climbing down the EROI ladder and increasing the ratio of energy cost to GDP. Energy, EROI, and financial return are related – the consequence of increasing energy costs is to put a brake on national economies and employment growth. Steve Kopits observed that Historically, when crude oil expenditure has reached 4% of GDP, the US has fallen into recession and that oil price pressure is typically not resolved by efficiency or conservation or adding capacity – they are solved by brutal recessions. James Hamilton and Carey King came to similar conclusions. However demand can be regulated. Navigating a path between affordable energy, improving the energy/GDP performance without inciting Jevon’s Paradox, and lifting productivity of the economy is going to be a challenge. Roger Clifton – maybe I’m reading you wrong but you seem to be advocating “oil shale” (kerogen,not oil) and coal to keep the motoring game going. Coal and kerogen are the two most filthy fossil fuels. And – “So supply is not constrained”. Not sure which planet you are on but it is certainly not Earth. Constrained supply of liquid fossil fuels will not reduce usage – it will only drive to lower grade and dirtier fuels and at lower prices than CSIRO forecast. Thus, demand must be managed so that this does not happen. I infer, perhaps incorrectly, that Roger is advocating pricing of carbon emissions as one means of managing demand. I wonder what tools he recommends to reduce demand. Oops: The last comment was in response to Podargus, not Roger Clifton. After the oil shock of 1973, the OPEC nations agreed to continue supply of crude oil sufficient to maintain the world economy. If they were competing with each other, the price would be similar to the cost of production. However the price of crude oil has moved much faster, from 20$ per barrel in 1990 to 100 $/bbl today. In effect, they are controlling the price of crude oil at the maximum price the market will pay. About 15 years ago there was public discussion by those in the know, concluding that alternative feedstocks (Queensland oil shale in particular) would only become commercially viable once the price of crude oil exceeded 40 $/bbl, permanently. However “permanently” is the keyword. As soon as a competitive alternative feedstock tries to penetrate the market, crude oil suppliers are able to drop the price for as long as it takes to drive the competition out of business. It is not just the technologies of oil shale and coal-to-liquids that are lying mothballed for an opportunity they may never be allowed, but also any non-carbon motive power from renewables and nuclear. Clearly, supply is not constrained. The belief that the world is running out of mineral resources is a religious faith that has no basis in fact. On the other hand demand can be regulated. Not suppressed, but diverted to non-carbon sources. A price on carbon would be a good start, but the alternative – non-carbon – supply must be made available so that the price-driven consumer can choose to buy it. The political will to achieve this may have to await for horror at the increasing climatic disasters to become widespread among the public. The belief that the world is running out of mineral resources is a religious faith that has no basis in fact. This a a big call … I think most of us agree that the price manipulations of OPEC have been a feature of the oil industry since the first oil crisis. But whether we can continue to ascribe all of the dynamics of oil pricing to OPEC is disputable. The cost of producing the marginal barrel of oil has been rising – annual capital spending for the industry has more than tripled in the past 10 years, to $550 billion in 2011. The USD$560 M Deepwater Horizon with $500,000 a day operating expenses highlights the direction we are heading. The rig operated in 1,200 metres of water, drilling a further 1,500 metres below the sea bed. This is a far cry from the Texan pumpjacks! Your points about “permanently” is a good one. Monash Energy cited uncertainty as one of the key barriers to proceeding with the Victorian brown coal-to-liquids project (which included sequestering the process emissions). This also included carbon pricing uncertainty. But perhaps we can use a carrot to tempt the public and thus avoid Nature’s stick. This carrot can be found in the synergy between EVs and baseload power, especially nuclear. 75 cents per gallon of gasoline equivalent, or 20 cents per liter of petrol, might well get people’s attention. A few years ago, there was a post on BNC entitled, “Nuclear Ammonia–a sustainable nuclear renaissance’s ‘Killer App’? Now we can ask the same about EVs. Are they a “killer app” for nuclear? There’s a unanimity of purpose in the Australian community, regarding EVs. Everybody seems to want them. The simplified message that’s in most people’s minds is the ‘pollution free’ tag. As misleading as this is, its a very appealing thought to most that we can keep driving, albeit without the climate and oil depletion repercussions. When it comes to energy supply-side choices there seems, again, to be a unanimity of purpose in support of EVs. Both the renewables lobby and the nuclear energy lobby put strong arguments that a transition to EVs is compatible with the respective energy supply being advocated. So, thanks to Graham for putting some sums to this. It’s lucky we are early days into this transition because very few understand the overall implications. There is a third argument – that sustaining private transport as our principle mode of transport is the fundamental problem. Much though the whole of society together with the vehicle manufacturers, will ensure the development of a boisterous EV market in years to come it is urban design that needs to be the major solution. The simplified message that’s in most people’s minds is the ‘pollution free’ tag. The vision of ‘pollution free’ driving is probably the immediate response to EVs. The less obvious, but perhaps more important outcome is the broader economic and productivity enhancing benefits. The electrification of personal transport represents one of the few step-change productivity enhancing projects that are readily available in the developed world. Overlaying personal (and small/local freight) onto the existing electrical grid and shifting to indigenous primary energy will generate possibly multi-decadal economy-wide productivity benefits. The implication is that investment policy should be mindful of the potentially broader benefits. Robert Gordon provides an excellent discussion of the role of the major industrial transformations in driving our standard of living upward. But he also highlights how most of the one-time-only changes have already occurred. The concept of “pollution free” is inextricably linked with carbon intensity of the source electricity. I won’t go into numbers here, but every electrical power system comes with a carbon-equivalent cost and this should never be forgotten or whitewashed by phrases such as “pollution free”. As Graham said, pollution free energy is not a vision. It is a mirage and an impossibility. Joe Public needs to be educated to understand that this is so, and to learn how to interpret carbon intensity figures, because until this is done, he will continue to be fooled by the mirage. (c) that reader can learn to understand carbon intensity in gCO2/kWh. Look them up. No energy source comes with a carbon intensity of zero. None can be pollution free… never, ever. Graham Palmer highlights the synergy between electric vehicles (EVs) and baseload power. But there is also a synergy between a carbon tax and both EVs and nuclear baseload. For example, the higher the carbon tax, the more EVs will be sold; and the more EVs sold, the greater the appetite for raising the carbon tax. The same goes for nuclear. So these three–EVs, nuclear, and a carbon tax–form a virtuous circle of synergy and positive feedback. Now Tesla has just announced that it intends to hit a run rate of 5,000 cars per week by the end of the year, and a rate of 10,000 per week (or 500,000 per year) sometime in 2018. This major advance will charge the circle and make progress in the other two areas more likely.